2013 in Review Or 2013 You Sucked! Normally I’m a pretty nostalgic person. I get a little sad at the end of the year over all the good times that had passed, the loved ones we may have lost, and the blessings we were granted. Not this year. Nope. I will be grateful when the clock strikes midnight and 2014 has finally arrived and the Year from Hell as breathed its last. 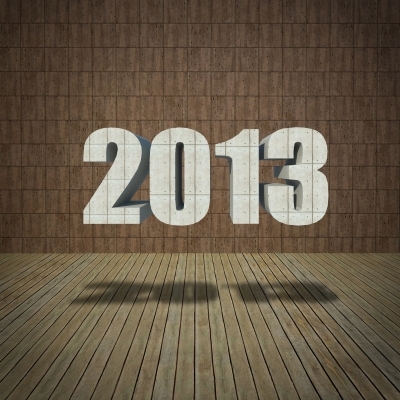 Don’t let the door hit ‘ya 2013! Who would have guessed just over two months later I would lose my job, and with it the sole source of income for the family. Unemployment in the state we were living in topped out at less than $400 a week, and I had been making more than that…much much more. Needless to say things went from bad to worse pretty fast. We moved to our home state to be closer to family and where there is a lower cost of living. A good idea but it took my kids away from the schools and friends they knew and forced them to start over in a location we weren’t (and still aren’t 100%) comfortable with. Fortunately my husband found a job in the industry he worked in before we moved away. Unfortunately he makes about a fifth of what I had been making. I applied for jobs every week and went on interviews, but got nowhere. I know it sounds like it, but it wasn’t all bad. I’ve been spending more time with my daughters. I’ve been cooking more, which means more things “from scratch” and less from a box like my husband does. My girls seem to like and it. I’m getting to cook with the girls and teach them a few things, which they seem to enjoy – but it can be hard to tell sometimes with a 15 year old. Let’s not forget I wrote my first novel. It still seems strange to type. I’ll be working on editing that and writing the next one in January. I don’t know where it’ll take me. Hopefully someone will read what I write, and I’ve got some ideas on how to get it out there, but at the moment telling some stories and getting them out of my head and on the page is the important part. I mean it doesn’t make much sense to plan on publishing and marketing when you don’t have a finished story yet. So I’m focusing on one step at a time. It’s so hard to look back and realize that in less than a year we went from giving to Toys for Tots and food pantries to receiving from them. I know it’s just a bump in the road. I know we’ll get through this. We’re together and that’s the most important part. Our family and friends are being really supportive and that’s huge. Despite everything that happened in this year we’re still hopeful. Things will get better. It doesn’t change the fact that 2013 sucked. Here’s hoping 2014 is better. Happy New Year All! Maybe it’s predictable. Maybe it’s a guilty pleasure for a lot of people. But, one of my all time favorite guilty pleasures is ice cream. 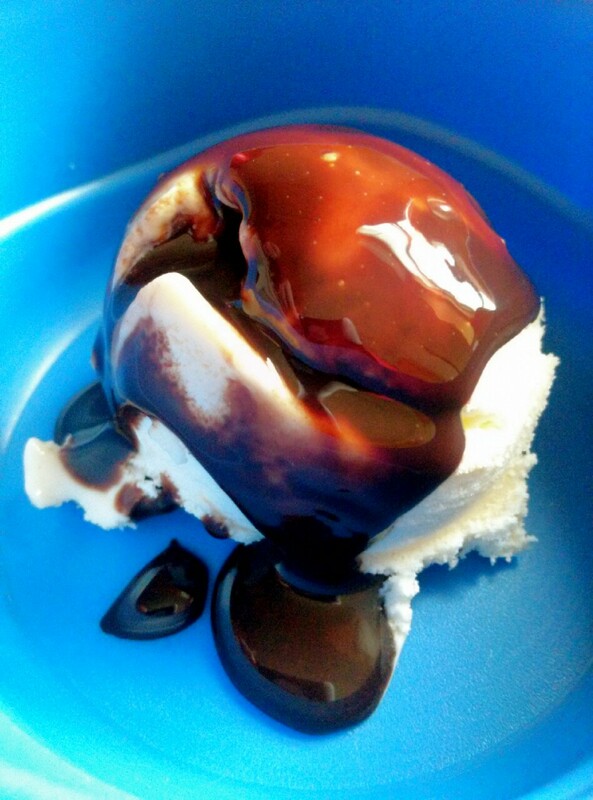 Specifically vanilla ice cream with chocolate syrup. Simple. Elegant. Yummy. Ice cream is one of my favorite guilty pleasures. I’m not going as far as a sundae. (If we’re talking sundaes I have to go with the hot fudge sundae.) I’m talking about dish of ice cream for medicinal purposes. You know what I mean, after a rough day a little ice cream can make the world a much better place. It’s one of the greatest pick-me-ups there is! My love of ice cream goes way back. I started eating it at night with my Dad when I was a little girl and it’s a habit I carry on today. I only eat a tiny serving, just enough for taking meds with (unless it’s been a really bad day), with just a little chocolate sauce (or more than just a little if it was a bad day). I don’t have many vices. I’ve never smoked, I rarely drank and now with all the medications I can’t drink. Ice cream and Coca-Cola are my vices (Coke is another guilty pleasure for another time!). I think like any other guilty pleasure, as long as you don’t go insane constantly then it’s ok. A lot of people may not agree. And that’s ok too. The way I look at it, one of the purposes of a guilty pleasure is make you feel better. There are so many things about chronic illness that make you feel bad physically and emotionally that if a couple of ounces of ice cream and chocolate make you feel a little better, a little more normal, a little more like you can face the world then it’s a good thing. So what are your food guilty pleasures? Not necessarily comfort foods, but that something you know you probably shouldn’t eat but you just can’t help it. I’d love to hear about it below! If you have an idea for a guilty pleasure post, or if you’d like to guest write a guilty pleasure post, drop me a line here and let me know what you’d like to do! Friday’s Guilty Pleasure – Girls’ Night IN! For this week’s guilty pleasure I thought I would share something I’ve been doing with my girls for a long time. When my oldest was a toddler when would have Girls’ Night Out when Daddy had to work late on Fridays. It usually consisted of chicken nuggets at the food court and a stroll around the mall. When the youngest arrived and money got tighter it became Girls’ Afternoon Out with a snack somewhere. As time went on and I started to run out of energy we started doing Girls Night In. 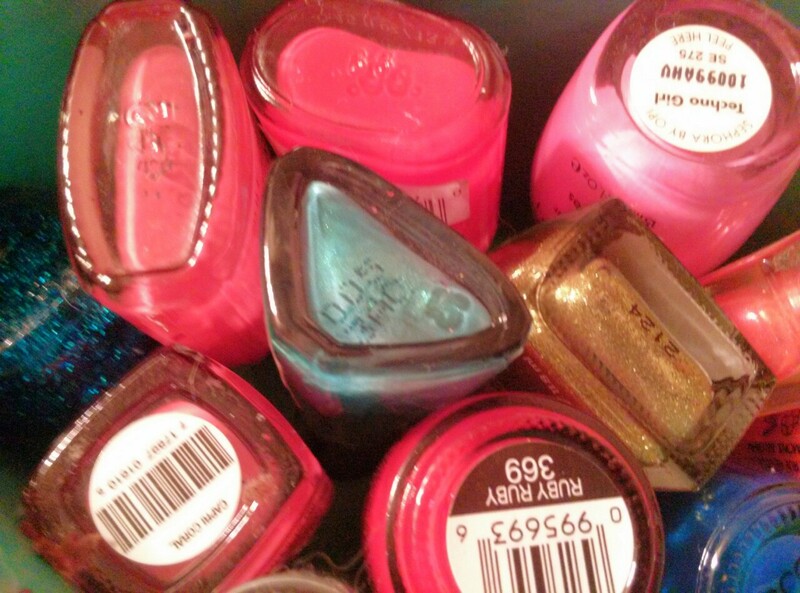 Girls’ Night In always involves nail polish at our house. Girls’ Night In usually happens on nights when my husband (AKA: Daddy) isn’t home. It consists of things like mini pedicures, painting nails, and a special snack (sometimes it’s something already in the house dressed up with sprinkles or chocolate sauce). We keep an eye out for tubes of peel-off face masks (the girls love feeling it dry and peeling it off) to go on sale and we’ll add those. The tiniest’s toes after Girl’s Night In. The girls love it. They feel special and grown up. It’s nice to pamper yourself, and your kids. It’s a great chance to sit and talk to them, give them the attention they want. For them it’s a huge treat and they look forward to the nights the three of us spend together. One of the best things about Girls’ Night In is that you can make it as guilty as you want. 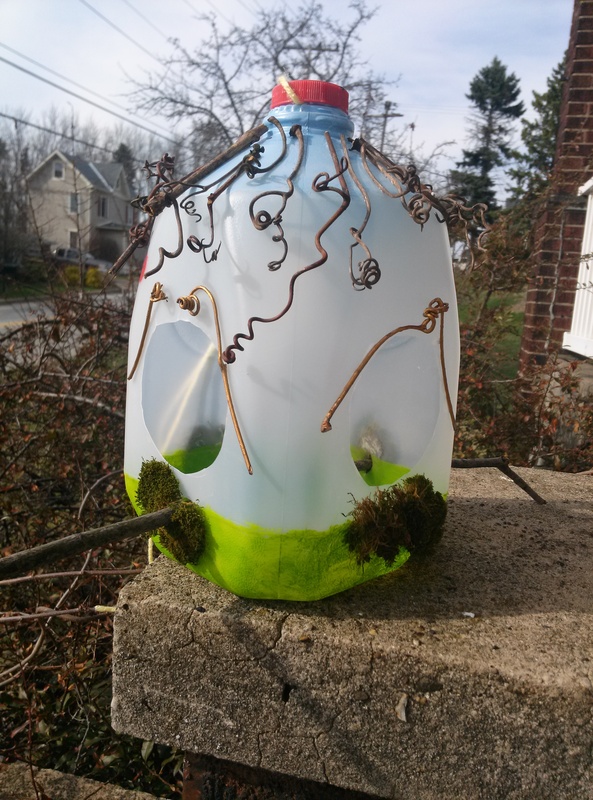 It doesn’t have to take a lot of energy or money. After the initial investment in nail polish and masks there’s no real cost, just your time. But you can expand the indulgences and the menu as much as you want, which makes it a great guilty pleasure. What guilty pleasure are you enjoying this week? Share below! We’re as ready as we can be for the start of our next new beginning. Today is the start of our next new beginning. 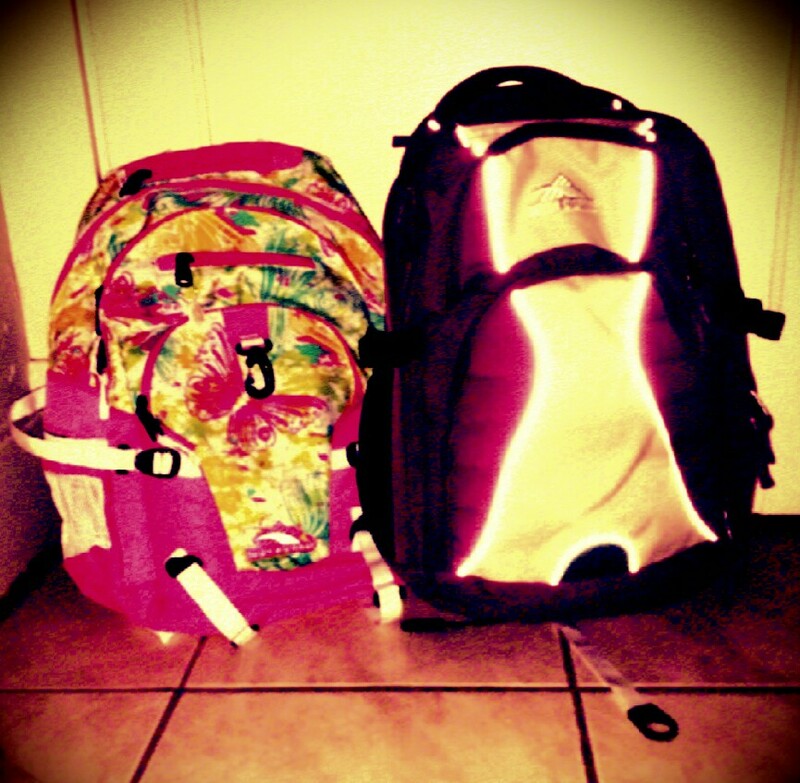 It’s the first day of school for the girls and the first day of work for my husband. The girls will be starting in new schools in a new state. My husband will working full-time for the first time in nearly 10 years, he’s mostly been a stay-at-home Dad since we moved to Virginia. For the first time I’m going to be the one in charge of getting the kids off to school and making sure homework gets done and everyone gets to where they need to be while I do freelance work from home. It’s a whole new world for all of us. We’re all trying to act pretty confident, but I think it’s pretty safe to say we’re all a little scared. You know, I think that’s ok. It’s a pretty big change for all of us. New (old) state. New schools. New jobs. It’s a lot for anyone. For a family that has unique circumstances, like chronic illness and a long stretch of unemployment, that much change seems like a bridge stretching over the Grand Canyon stretching out in front of you. You know all you need to do is take that first step, but it’s a doozy. There’s not a lot of choice but to move forward so you do. You just have to have faith that you’ll make it to the other side. We’ll see what lies ahead. One way or another, I think we’ll be okay. Everyone got on their way with on mild panic. The bus forgot to pick up the oldest and we had to get that straightened out. Other than that everything went off without a hitch. Now it’s a matter of convincing myself to do start the ambitious list of things I made. 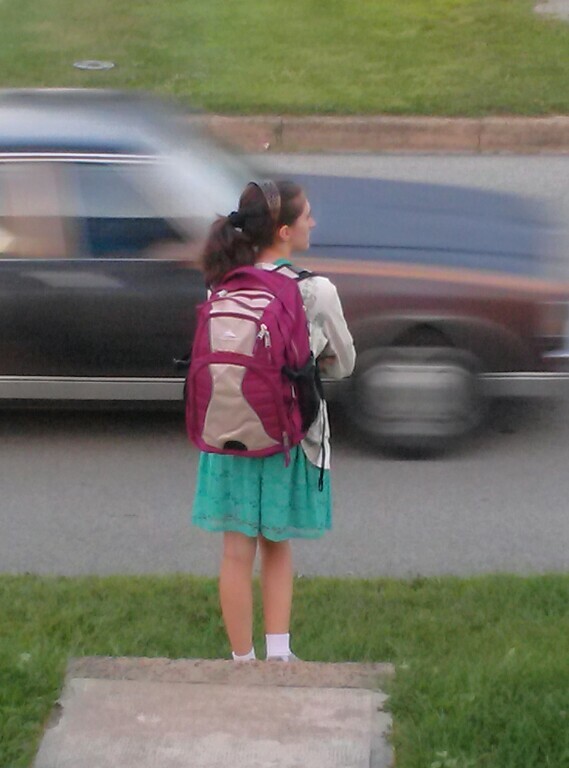 My oldest waiting for the bus that forgot to pick her up. Great way to start the day. 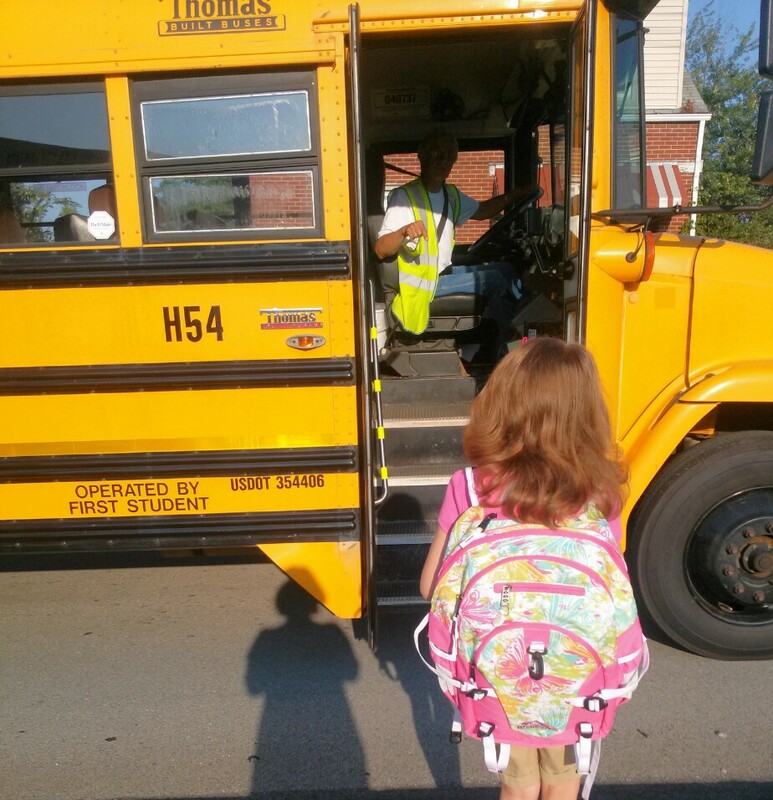 This is first time she’ll be taking the bus to school (she used to walk to school), so this is VERY exciting. My husband got the official call last night, he’s got the job! No idea on start date yet, but isn’t that amazing? Since neither of has worked since February it’s freaking spectacular! He hasn’t worked full-time in 9.5 years (he’s mostly been a stay-at-home dad) so it’s a little scary and nerve-wracking for all of us too. But that’s ok. We keep telling the kids, and have since I lost my job, it’s alright to be worried, or scared, or angry. Mommy and Daddy are sometimes too. But as long as we stick together and lean on each other we’ll be ok. If we learned nothing else by leaving our hometown and moving to a different state it’s that we can stand on our own and depend on ourselves to get out of whatever mess we get into. Some sort of help may arrive eventually, maybe, more often than not it’s too little too late. But the four of us can get through anything as long as we talk things out, are as honest as possible and stay together. And I have a feeling the changes aren’t over yet. The job is over an hour, and over a mountain, from where we just moved. Which isn’t horrible in August. But come a Pennsylvania winter in our ONLY car, a small engine Ford Focus, it gets more…complicated. I personally was in a car that spun out and ended up in a ditch at the very top of that mountain in a snowstorm late one Christmas Eve. It gets ugly fast up there. Of course there’s more than one way over, or around any mountain. Or problem. There are short-term and long-term solutions. Like buying a second car, if we can find one we can afford. Or moving back to our hometown which, strangely enough, just so happens to be where his new job is located. Or any number of other possibilities yet to be thought up and explored. Both are valid ideas with differing degrees of do-ability under the current circumstances. It’s going to mean taking some time as a family and talking. Figuring out together what’s best for all of us, we’re all in this together.